NEWLY ELECTED PRESIDENT OF THE UNION CAITLIN KENNEDY '20 READS a motion. 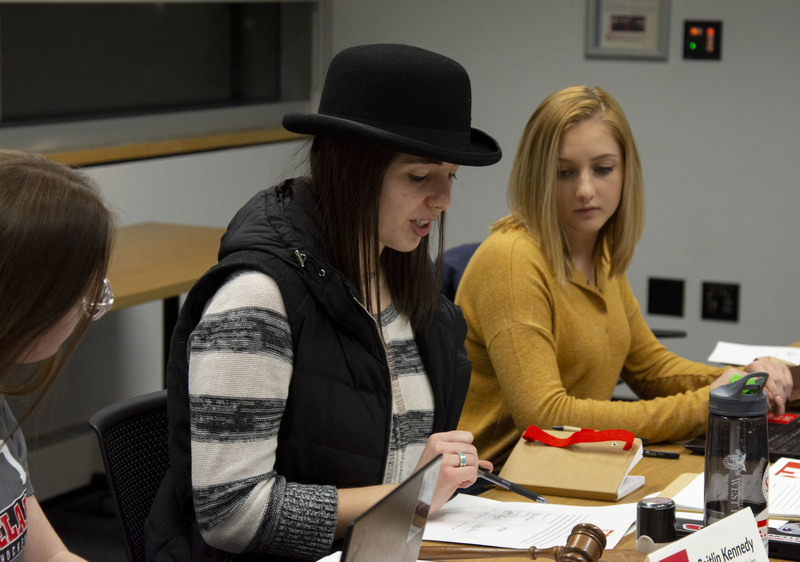 President of the Union Caitlin Kennedy ’19 chaired her first Executive Board meeting on Thursday.President of the Union Caitlin Kennedy ’20 chaired her first Executive Board meeting on Thursday. During this, the Board approved reallocations, subsidized a program, heard a presentation by the Model Railroad Society, and took Statler & Waldorf off probation. During this, Jazz Ensemble was allowed a $560 reallocation for their “Evening of Jazz” performance. Additionally, Rensselaer Model Railroad Society presented their ongoing plan to move the display out of Davidson Hall. The RPI Embedded Hardware Club was approved $1,250 for training for the Bot printer as part of a contingency of purchase earlier this semester. Also, a motion to approve the transfer of servers of Union sites from the VCC to the Union was approved, and Statler and Waldorf was taken off probation. Evening of Jazz, Jazz Ensemble’s most popular event for the past four years, costs around $30 for students due to dining and service costs. Jazz Ensemble requested a $560 reallocation from unused funds for a trip that was covered by another grant to help drive this cost down. Policies Committee Chairperson David Raab ’19 raised concern that in years past, the menu has been excessive. The club responded to this, explaining that the year with the extravagant menu was influenced and funded by President Shirley Ann Jackson. A motion to approve the reallocation was passed unanimously, and a second motion to require the menu to be revised and approved by their student activities resource person was passed unanimously. The Model Railroad Society presented their process for moving their model railroad out of Davison Hall, which has never been moved before. The 4,000 square foot display was marked and cut. It is currently being moved to its new location at 258 Hoosick Street. Raab mentioned that five to six figures of administrative dollars, as opposed to Union dollars, were spent on this. He added that this process was incredibly difficult to carry out. To acknowledge this, a motion was made to thank everyone involved, which passed unanimously. The Embedded Hardware Club was approved to purchase a BotFactory printer several weeks ago, under the condition that they were trained to use the equipment. They came before the Board to request $1,250 for this training, which was proposed to begin in late May. Club and Organization Representative Cody Kazakoff asked if there were anyway to do this in the fall when more people are present. The reason for earlier training was due to lower demand for the equipment. However, trained members can train others using additional resources, such as the full manual that comes with the printer. The motion to approve $1,250 for training for the BotFactory printer passed 12-0-1. Raab presented a plan to move the Union sites over to the DotCIO server rather than the Union’s hardware, given the benefits of recovery backups and automatic rollover in case of hardware failure. The cost of contracting this out is $3,800 to $4,200 annually, comparable to the current cost of $4,000. The motion to approve this switch passed unanimously. Additionally The Polytechnic’s storage room on the third floor of the Union was revoked and reallocated to W2SZ with a vote of 14-0-1, and Statler & Waldorf was taken off probation unanimously.